Our city planner Al Rezoski is overwhelmed with projects and still takes time to inform YQNA and ask our opinions. Yet, even an outsider can tell that the City’s Planning Department is in jeopardy. More than 200 large buildings are in the planning stages downtown and 39,000 homes – mostly condos – are in the pipeline. To shape and guide these developments, the downtown Planning Department has three planners and a temporary chief planner in place of Ted Tyndal, who is on sick leave. Three planning jobs are open, but even when they are eventually filled the department is a shadow of its former self. YQNA’s Planning and Development Committee has grave concerns about the many building projects in our area. The new co-chairs, James Russell and Bob Rasmussen, wrote a letter to Mayor David Miller with copies to all City Councillors, pleading with them to restore funding to the Planning Department to usher in the biggest building boom in Toronto’s history. We await their replies. The meeting was attended by twelve planning students in their final year at Ryerson University and their Associate Director and Professor, Mitchell Kosny, MRCP, Phd. Also attending were representatives from Harbourfront, the QQHBIA, Bathurst Quay Neighbourhood Association, the St. Lawrence Neighbourhood Association, York Quay Neighbourhood Association, and Waterfront Action. Local business representatives included Ms. Chinyere Eni, Branch Manager of the Royal Bank of Canada, located in the Queen’s Quay Terminal Building and Kevin Currie, of Wheel Excitement. Our HarbourSide resident, Braz Menezes, who conceived the project, also chaired the meeting. At the meeting the students were given a list of priorities and then asked to prepare a strategy for the economic and physical transformation of Queen’s Quay over the next few years. There will be a mid-session review of the student’s work near the end of October. They will present their final report in December of this year. While the Ryerson students are working on their strategy for our neighbourhood, five University of Toronto students will be looking at the impact that condo tower congestion has on our lives, both physically and socially. Thanks to Braz, and the QQHBIA, Ryerson University and the University of Toronto for helping to get their project off the ground. We are all looking forward to receiving the student’s final presentation. cascading snowflakes on the tower. It’ll be beautiful! 18, 2007 and celebrate our Kick-off 2007 Kick-off. Don’t forget to bring your old strings of lights. TABIA and Toronto Hydro will be on hand once again to exchange your old lights for brand new, energy efficient LED”S. ” Patience and confidence have disappeared after a dreadful year for SAS. As a result, none of SAS’s passengers will ever fly in a Q400 plane again,” said SAS’s chief operating officer Mats Jansson. It is already clear that the decision to replace 27 Q400 planes will cost SAS millions and will negatively affect the company’s economy. 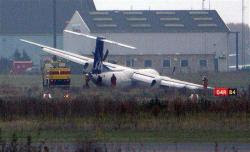 “We have had problems with this plane for a long time and have suffered three crash landings. Consequently we must get rid of the plane entirely,” continued Jansson. SAS will buy or rent new planes to replace the grounded Q400 planes. SAS will attempt to get Bombardier to take back the planes. “Lease agreements on the planes expire in 2010 and 2012. SAS will not lease these planes out to others. We will attempt to get Bombardier to take back the planes. They can then decide if they will lease them to others or what they want to do with them,” said John Dueholm, vice president of SAS. That’s it for now …. I think the big story here is that 27 planes might be returned to Bombardier. What’ll happen to them? The Danish story suggests that these planes will continue to fly somewhere, leased to unsuspecting or cash-strapped companies. Are we connecting the dots to the local scene?